We had avoided relegation with two games to spare but with a new board in charge at Turf Moor things were beginning to look a bit better for us. As the players reported back for training there were new faces and one of them was Luton Town's left back Mitchell Thomas. 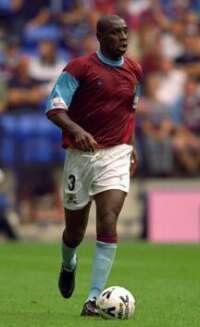 Thomas had without any doubt been a top player in his career and had been with both Spurs in the old First Division and with West Ham in the Premiership. 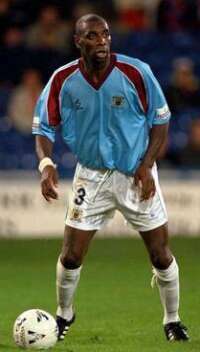 In late 1993 though he had gone back to Luton Town, his first club and was now joining the Clarets after almost another six years with the Hatters. There seemed no logic in the signing at all, left back had been a problem position but we now had Tom Cowan. 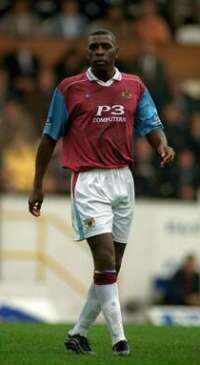 Thomas appeared to be well past his sell by date and comments from Luton fans were of relief that he was leaving. They said he was finished and his legs were gone. It had been suggested that Mitchell was coming in as a player/coach but this was quickly dismissed by Stan who insisted that Thomas had signed as a player only. We had signed a 34 year-old then as cover at left-back for Tom Cowan and to be fair the fans were far from impressed. Little did we know. On the opening day of the season we made the trip to Wycombe to find that Tom Cowan hadn't won a place in the side. So it was going to be Thomas at left back, in fact no Paul Smith played there and Mitchell played in the centre of defence. He played well in this position and continued to play in the centre of defence for virtually the whole season. We soon realised that not only was he not a bad signing he was actually proving to be one of our better signings. He had an outstanding season and missed just two games and it is worth noting that we conceded seven goals in the two games he missed against Bury and Preston. If playing so well week in and week out wasn't enough he was also a major influence on Ian Wright coming to the Turf, a move that proved the catalyst for our push, and successful push, for automatic promotion. By the end of the season I'm sure Mitchell would have been a more than worthy winner of the Player of the Year awards but missed out mainly because of a Natural Born Claret called Andy Payton scoring a total of 27 goals in the promotion campaign. The 34 year-old who was not acclaimed in 1999 from the stands when he joined the club for a year was now out of contract and this time we all demanded that he stay. He did, this time on a two year deal, as we prepared for life back in Division One. Some said Mitchell wouldn't be able to cope any longer at the higher level at the age of 35 but they were now in a very small minority. In any case Mitchell proved them wrong as he carried on where he had left off the previous season with some outstanding displays as the Clarets got off to a good start. He was turning in good performance after good performance and must have been one of the first names on Stan's team sheet every game. He played in a back three, as a central defender in a back four and also at full back but one thing for certain was he would perform well. By the beginning of April he had missed just one game but an injury forced him to miss a couple more and then two more games when he was named as a substitute. In the last few games he looked to be struggling although he was not fully fit from the injury. Sadly we had seen the best of Mitchell but only because injury took hold. He missed pre-season training and it was September before he was able to play. No sooner was he back than he was back out again with the same groin injury and this time until March. Many thought we had seen the last of him but he won back his place in the side at Stockport and was an ever present for the rest of the season as we pushed for a place in the play offs. He played the full ninety minutes in all of these games until the last day of the season when, with just 25 minutes to go, he was substituted being replaced with Gareth Taylor. There seemed some inevitability about it and as he left he went to a standing ovation from the Clarets fans and also, and significantly, from the bench and subs. It was to be his last appearance and just two days later was released on a free transfer. There may have been some who didn't think signing Mitchell Thomas was such a good idea, there is one thing for certain that after three years there will be no one who will think he wasn't a good signing. He has been nothing short of a superb signing for the Clarets and it is only a pity that his last season was marred by injury. Mitchell leaves owing us nothing and goes with all our best wishes.